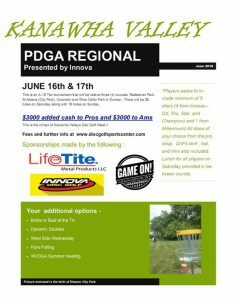 The Fourth Annual Kanawha Valley Regional Tournament Presented by Innova will take place Saturday, June 16, and Sunday, June 17, 2018. This is a pro A-tier/amateur B-tier tournament. As in past tournaments, the tournament will consist of three rounds. This year’s tournament will see play at Coonskin Park, Redeemer Park, and Wine Cellar Park. The week of the tournament will be full of disc golf events. Online registration and schedule information can be found at The Disc Golf Scene. 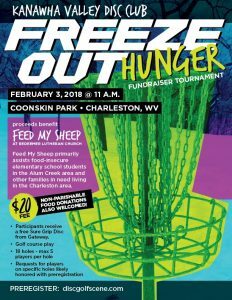 The Kanawha Valley Freeze Out Hunger charity tournament will take place Saturday, February 3. Please note that weather may affect the start time of play. 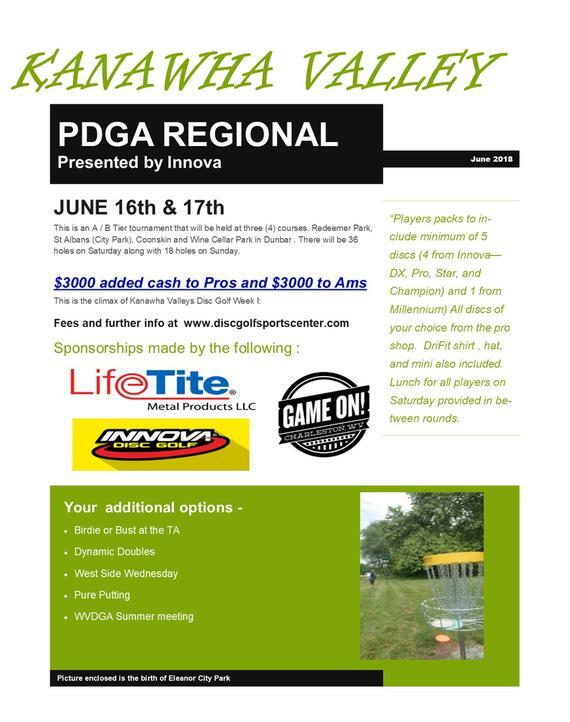 For registration and schedule information, visit the Disc Golf Scene. All participants will receive free Sure Grip Disc from Gateway. This will be the first year playing on a golf course. 18 holes – max 5 players per hole and requests for players on specific holes will try to be honored if you preregister. Participants can bring a food donation in addition to monetary contributions. Click here for a list of preferred food items. Mulligans can be purchased for fundraising purposes at $1.00 per mulligan with a $20.00 max for the tournament. Each mulligan purchased will enter you into raffle. At the $10.00 and $20.00 levels there will be choice of free shirt, disc or other miscellaneous gift as a thanks for donating to a worthy cause. 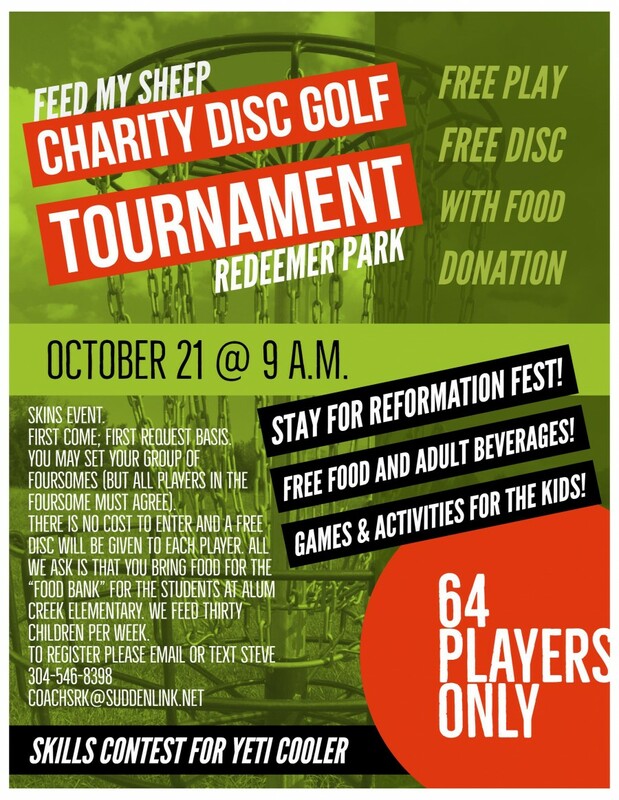 On Saturday, October 21, Redeemer Park will host the Feed My Sheep Charity Disc Golf Tournament. This is a skins event. Each players can choose the other three competitors on his or her card provided the entire foursome agrees. In addition to the skins tournament, there will be a skills contest in which players compete for a Yeti cooler. 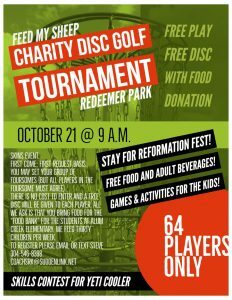 The tournament is part of Reformation Fest, and free food and adult beverages will be served. Kids will have access to games and activities. Registration is free and will take place on a first-come, first-serve basis. Players are asked to bring food for the food bank for Alum Creek Elementary students. Each player will receive a free disc. 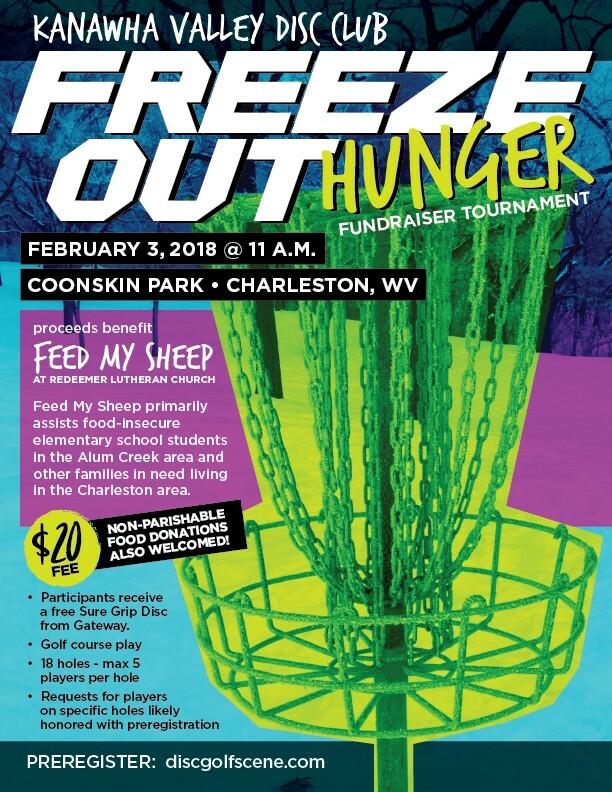 Visit The Disc Golf Scene for more information. 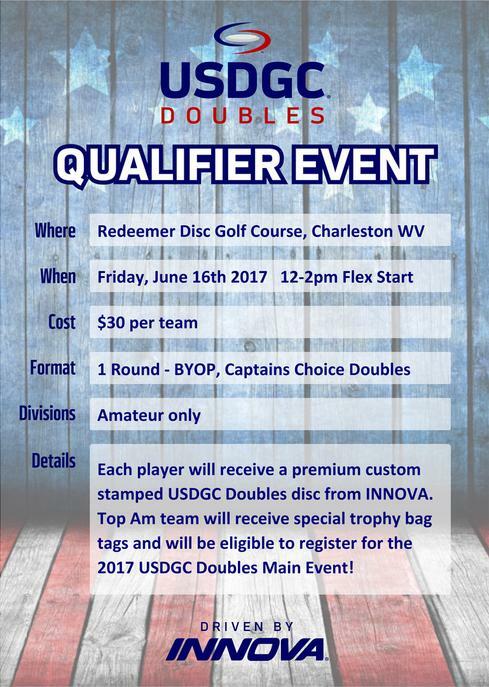 A 2017 USDGC Doubles Qualifier has been added to the already-packed schedule for the week of the 3rd Annual Kanawha Valley Regional Tournament! The format is Bring Your Own Partner – Captain’s Choice. The cost to register is $30 per team. The event takes place Friday, June 16, 2017, at Redeemer Park. There is a 12pm-2pm flex start. Each player receives a premium custom stamped USDGC Doubles disc from Innova, and the top team will receive special trophy bag tags and eligibility to register for the 2017 USDGC Doubles Main Event. 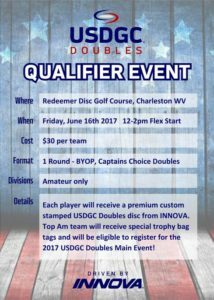 Online registration for the qualifier is at Disc Golf United. This year’s Kanawha Valley Regional Tournament takes place on Saturday, June 17, and Sunday, June 18. However, the week of Monday, June 12, will be full of fun disc golf-related events.